Now that the Elder Scrolls MMO that everybody bugged Todd Howard about for a decade has finally come to pass, for better or worse, it’s hard to imagine Bethesda haven’t thought about giving Fallout the same treatment. 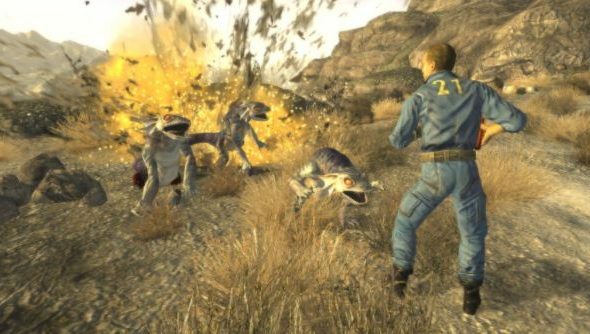 One man involved with series has definitely given it some thought: Josh Sawyer, project lead on Obsidian’s Fallout: New Vegas. “I think there’s interesting potential for an online version of Fallout,” he said. “Personally, I think there are some interesting things that could happen with Fallout in an MMO environment,” Sawyer told IGN. Sawyer recalled a fan project which “cobbled together” Fallout 2 assets into a makeshift multiplayer world. It seems likely that a potential Fallout Online would be handled by Bethesda’s dedicated MMO studio, Zenimax Online. But Sawyer knows where Obsidian would take the series, given the opportunity. “I like doing stuff on the West coast because we’re close by, and that’s kind of been a tradition for the West coast developers of that stuff,” he said. The idea of a Fallout MMO extends back to Black Isle – Brian Fargo proposed one in the ’90s. And a Fallout Online was briefly in development under nu-Interplay a few years ago, with series veteran Chris Taylor at the helm. Legal wrangles and a serious lack of funding saw to that, though. Here’s my question: how do you convincingly populate a mostly-deserted wasteland with players?